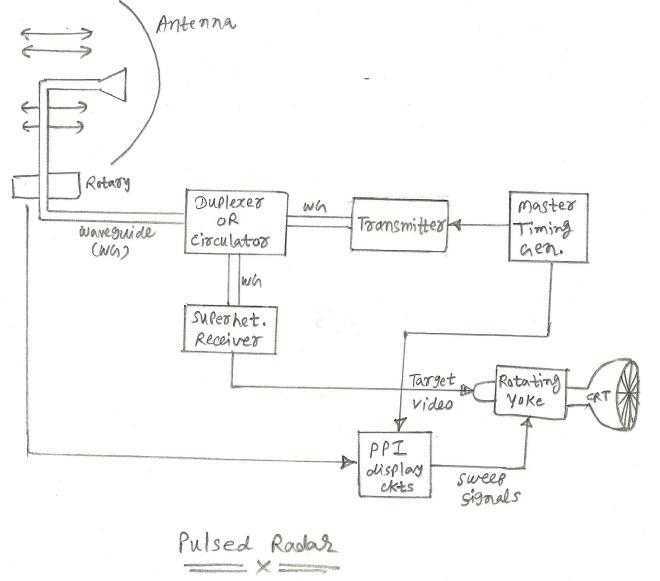 This radar tutorial covers radar system basics,types of radar and radar applications.Radar tutorial also covers radar types pulsed radar,FMCW radar,phased array radar etc. As we know that RADAR is the short form derived from RAdio Detection And Ranging. It is mainly used to determine or detect that some object lies at so and so distance away. This object is the one which can not be observed visually by the eye. In the radar system, radar unit or radar station transmits high frequency RF signals, which gets reflected from the target. 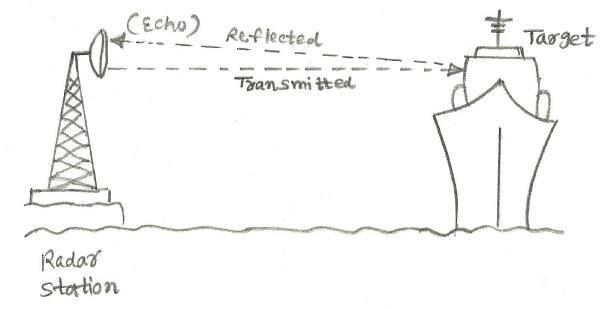 This reflected signal(referred as 'echo') is received by the radar station helps determine distance of the target from radar station. It also helps determine direction,azimuth,elevation of the target. The same concept is illustrated in the figure. Where, D is the distance between radar station and object in nautical miles. T is the total time from transmission of the signal and reception of the signal in micro-sec. In most of the radar applications, Nautical mile is used in place of statute miles for the measurement purposes. A Nautical mile is equal to 6076 ft.
As part of radar tutorial let us understand different types of radar. These radar types depend upon techniques used for the measurement of radar parameters such as range, azimuth, elevation and velocity. Radars fall into two major categories referred as primary radar and secondary radar. The main type of radar is primary radar. These radars transmit Continuous Wave(CW) as well as pulse. The reflected CW and pulse received are processed by the radar to determine range, velocity, elevation and azimuth. The examples of primary radar are the one used for ground penetrating radar, air based search radar, weapon control radar and so on. Primary radars are further categorized into CW radar and pulse radar. Unmodulated CW radar and FMCW radar system fall under CW radar. MTI (Moving Target Indicator) pulse radar and pulse doppler radar are pulse radars. Secondary radars are the one used to provide identity and altitute related information. The example of secondary radars are IFF radars (Identification Friend or Foe). These radars respond when they will be interrogated by some other radars using encrypted signals. Ground radars or airborne radars are used for this purpose. There are basically two main types of radar systems viz. pulsed radar and CW(continuous wave) radar. These pulse and CW radars have been explained below in brief. There is another radar by name phased array radar which uses multiple dipoles instead of single horn/parabolic reflector. Radars are also classified based on the functionalities such as air traffic radar, police radar, weather radar, defense radar, marine radar, ground penetrating radar and so on. The function of these radars are outlined in the table below. Air defense radar It determines target location and launch weapon to destroy. Air Borne radar It is used for navigation mainly for flight operations. It guides Aircraft even in thick cloud. It is also used for military applications. Air traffic radar It determines location of aircraft landing at the airport. It helps aircraft land under poor weather and poor visibility conditions. Police radar It locates and determines fast moving vehicles. Marine radar It determines location of shore and ships. Ground radar This radar creats a radar map of the ground from either satellite or aircraft. Missile guidance Controls the path of the missile launched from the ground towards the target. Weather radar This weather radar forcasts weather condition before taking off of the aircraft. Docking radar Guide vehicles to the correct docking position. Terrain Guidance radar It helps guiding the aircraft during the flight about mountains and terrains over the route. In this Pulse radar, signals are transmitted in short pulses(bursts). The duration or width of the pulse is very short and will be fom microsec to several microseconds. The distance of the object is determined by measurement of time delay from the time pulse is transmitted to the time echo is received. PRT is the time between transmitted pulses, called Pulse Repetition Time. Duty Cycle = w(100)/PRT, unit of percentage. In this CW radar,a constant amplitude continuous sine wave in microwave frequency range is transmitted. This amplitude variations of the echo will not help determine the object, but as the object moves there will be frequency change observed between transmitted and received echo. This frequency shift between transmitted signal and received echo is referred as doppler effect. This helps determine relative speed between radar unit and the target object. This doppler effect provides frequency modulation of the carrier. The variation to this concept is the FM continuous wave radar,here carrier is continuous but is frequency modulated by a sawtooth or triangular wave. The main applications are defense surveillance systems, navigation and locating enemy targets. They are used as altimeters. High frequency radars are also used to plot or to map the terrain in the area. There are many as mentioned above in the table. As per basic principle RF burst is transmitted towards the target and receiver is turned to listen for the echo reflected from the target.This pulse will have very short pulse duration of width (T) and long receiver time between pulses. The number of pulses per second is referred as Pulse Repetition Rate(PRR) or Pulse Repetition Frequency(PRF). The time between the on-set of consecutive pulses is referred as Pulse Repetition Time(PRT). t is the time in seconds between the original transmitted pulse and arrival of the echo from the target. For example, a target return echo in 98 microsecond after the time of transmitted pulse. calculate the radar range to the target. Refer links mentioned below on this radar tutorial for radar bands, radar scope (A-scope, B-scope, C-Scope, D-scope, E-scope), doppler radar, fmcw radar system, weather radar amd ground penetrating radar system along with depth table is mentioned.